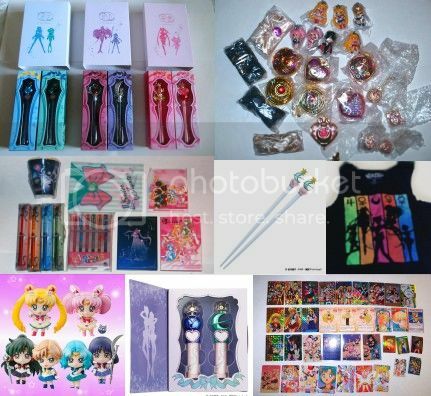 Most SM items have been moved to my StorEnvy & eCrater. The VHS tape is still available. Please check the stores for updated inventory. Feel free to leave a comment here if there's anything you want to buy. • First to pay has priority. • Holds will be accepted depending on my mood and item popularity. I'm a laid back and understanding person so long as you don't jerk me around. • Items will only be held for a maximum of 3 days unless buyer submits a deposit or we've had prior transactions. • Let me know if you want an item. Deals often fall through & people disappear. • Price offers are accepted but please be reasonable. • RED PRICES denote books that were hesitantly considered for sale. Please submit your best offer. Keep in mind these are books from my personal collection and each book has a varying degree of sale priority. • The items are available until they are marked sold. • Feedback ratings: feedback post, eBay profile, eCrater feedback, and MUA. For reference, past LJ sales are here. • Paypal, POSTAL money order (not bank), and USD cash accepted. • No order cancellations once the item is sent out. No refunds or returns. All sales are final. • Shipping cost is about $5 in the USA. International is around $8 (varies). • Prices listed do not include shipping (unless stated). Combined shipping available. • USA RESIDENTS: Items ship within 2-5 business days after receiving cleared payment. • INTERNATIONAL RESIDENTS: Items ship within 5-10 business days after receiving cleared payment. These packages must be brought to the post office. • In a comment or e-mail, please indicate the desired items and your country. • You may also visit the eCrater store to instantly purchase items. • EBAY: If desired, it is possible for me to list any of these books on eBay. However, there will be an extra $3-$5 increase in price to cover the high fees. Doujinshi wishlist and collection reference. Might be interested in either buying or trading. Willing to pay big bucks for Hibari/Chrome doujinshi, around $20-$60. Still have a few extra shitajiki that need to be sold. 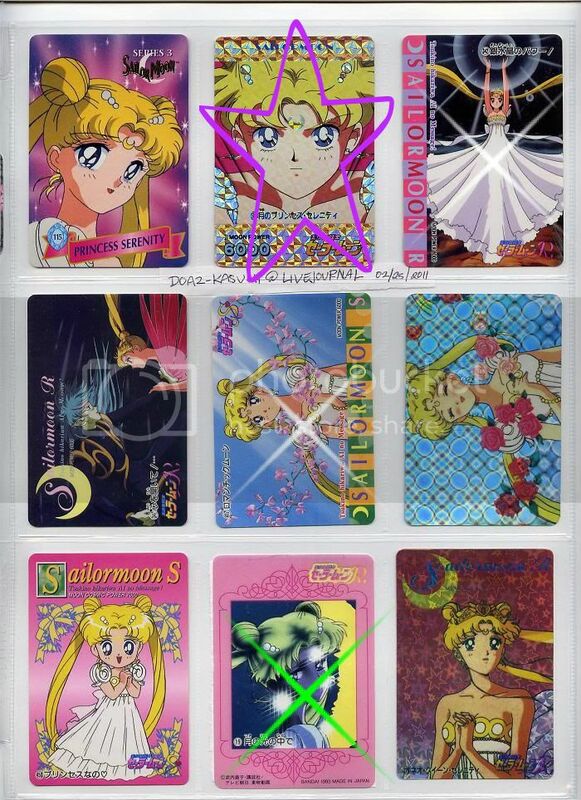 - SM27 is cool because it has a separate sheet with their names that overlays the main board. - May be willing to trade SM29 Venus nouveau for the Mars nouveau board (or any other shitajiki). - My complete SM shitajiki collection is here. Thinking about selling some of them one day. 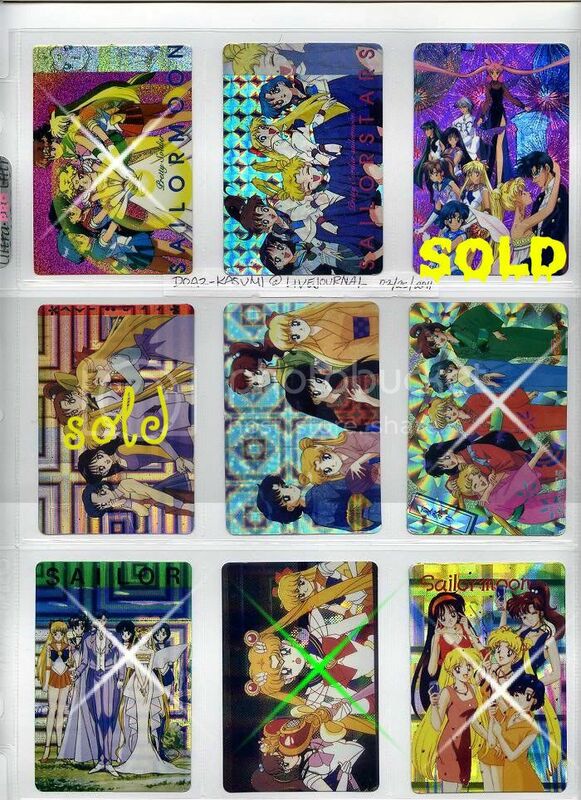 All that's left are the first 8 + the Jupiter boards. Some of these are quite nice though I have never heard of any of these series, so I don't know the value. I'm offering 1 free with each $10 shitajiki purchase. Or $6 shipped if you would rather buy them. Kinda unsure about these jumbo cards and may change my mind. 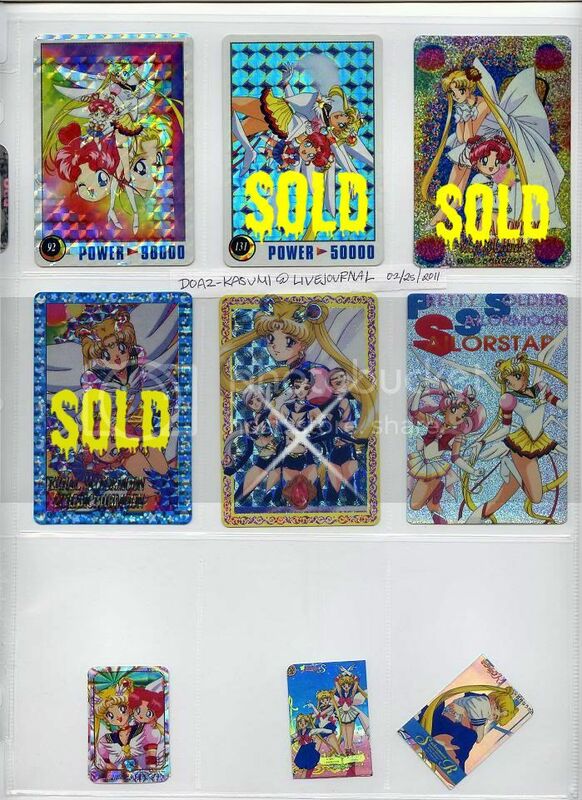 First pic is a group shot for proof of ownership, some cards not available for sale atm but may change in the future. Inquire if interested. $8 each for regular jumbo cards. Offer. If these aren't worth a decent amount then won't bother selling. Offer. 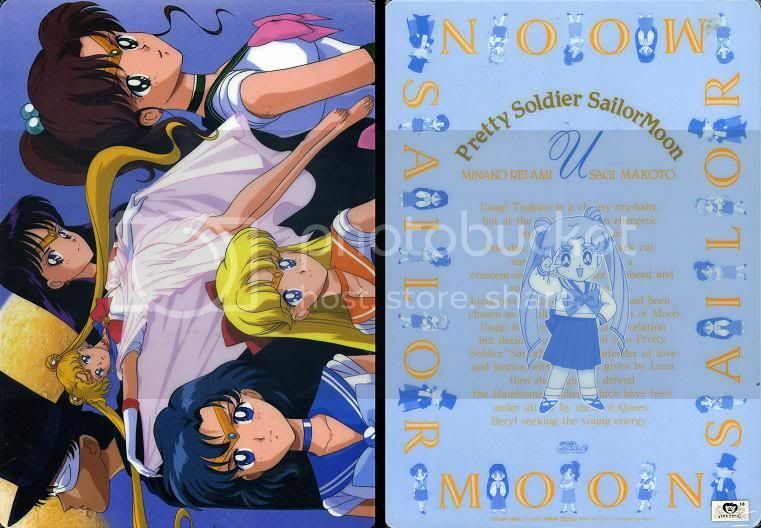 Sailor Moon Fanclub cards. ID member card will not come with the set unless specifically requested. It has my name written on the back but will be crossed out. May or may not sell depending on the value. Want to get rid of EVERYTHING in this section. There's around 200-300(?) 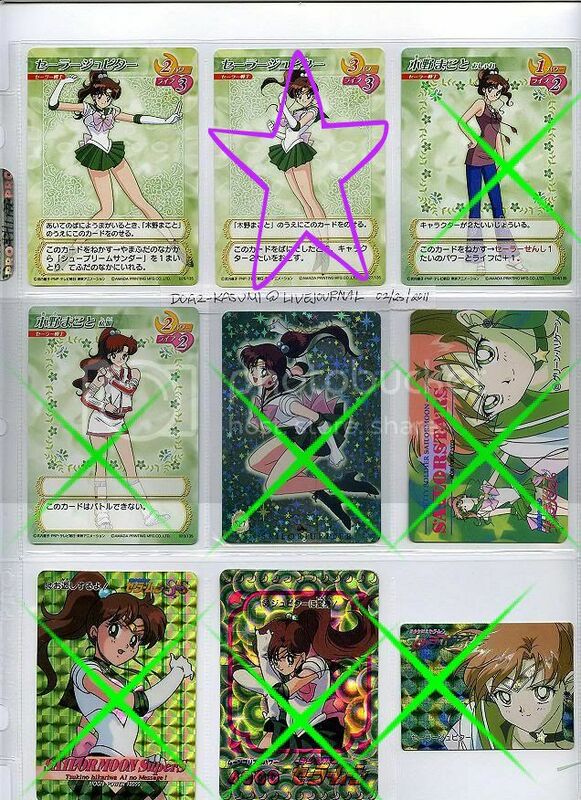 cards here and would be nice to maybe sell them off together (make offers). Please keep in mind that 'TRADING CARDS' and 'CARD COLLECTION' are two entirely different sections. 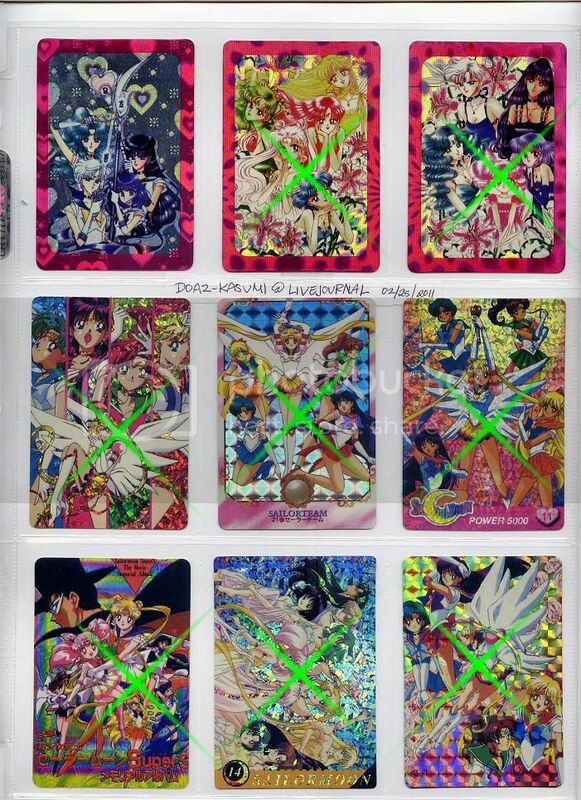 Beautiful manga prism stickers, hard to find! Some of these go for $6+ on eBay (last time i participated in auctions, anyway @@). Outers prism sticker card (very pretty heart pattern~!). Paid about $8 for this. Perfect condition. rest: $1-$5 each depending on condition, may give some for free with other purchases. .25~.50 each depending on card or offer for all. Archival & Series 3 cards. .25ea or offer for all American TCG. $8? Think I bought the sparkly sticker set for that much. #4-8 on 2nd page are magnets/regular cards which are also available. .50 each or offer for entire lot. .50~$1 each depending on card, may give some for free with other purchases. .25 each, may give free with other purchases. green cross = generally not for sale but you can ask. favorites. Price: Depends on card. .25, .50, $1, $2, or more. Haven't had the chance to re-scan these yet. 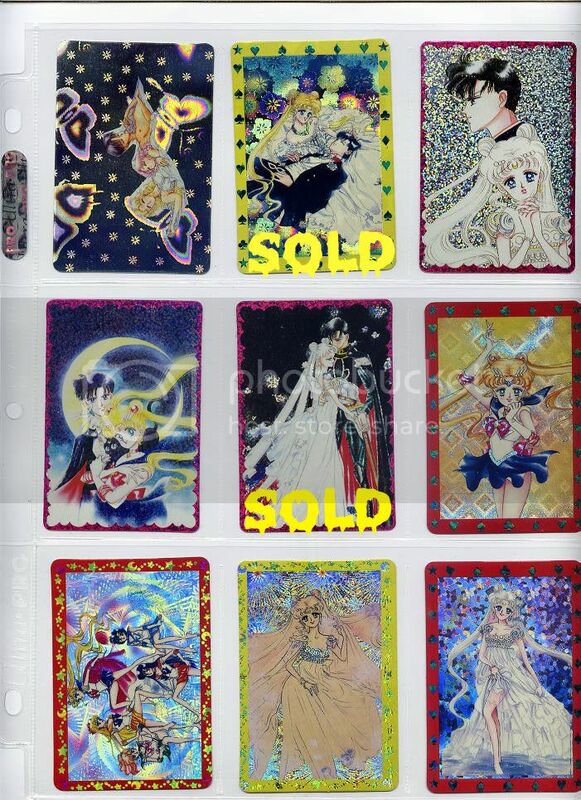 Some aren't for sale: anything with Queen Serenity, Neo Queen Serenity, Jupiter, or Venus.. I don't know if they are still available but can I get these two shipped to 91204? 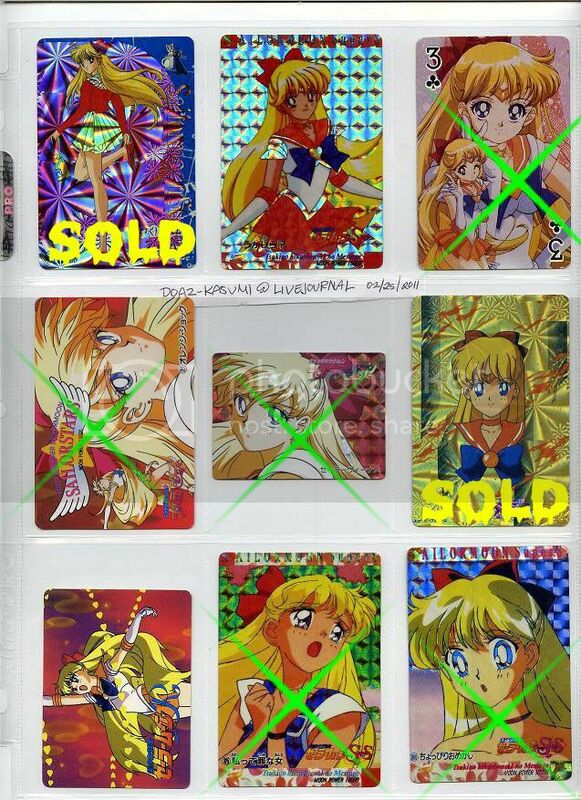 http://s490.photobucket.com/albums/rr267/djscans/sailor%20moon/cards/?action=view¤t=cards58.jpg --> the two white crossed lami cards, I know they're "might sells" but I wanted to see how much they were going for anyway. 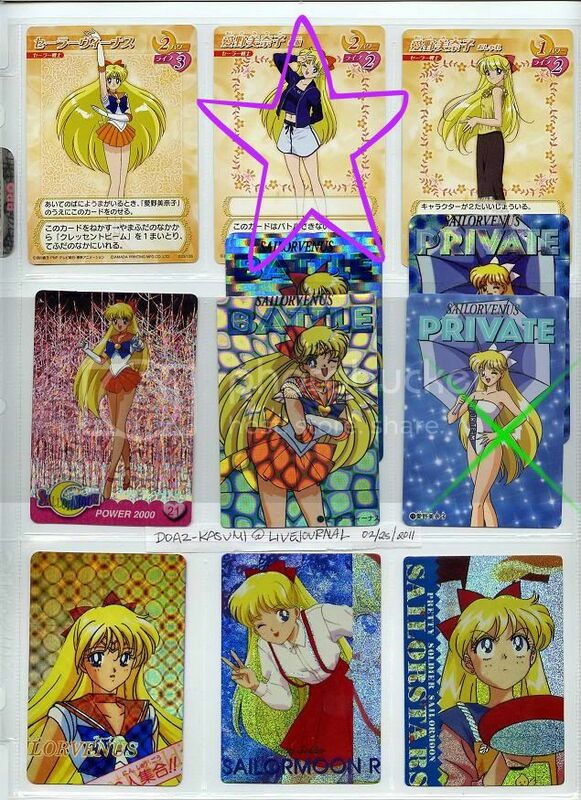 http://s490.photobucket.com/albums/rr267/djscans/sailor%20moon/cards/?action=view¤t=cards39.jpg --> third row middle lami card. 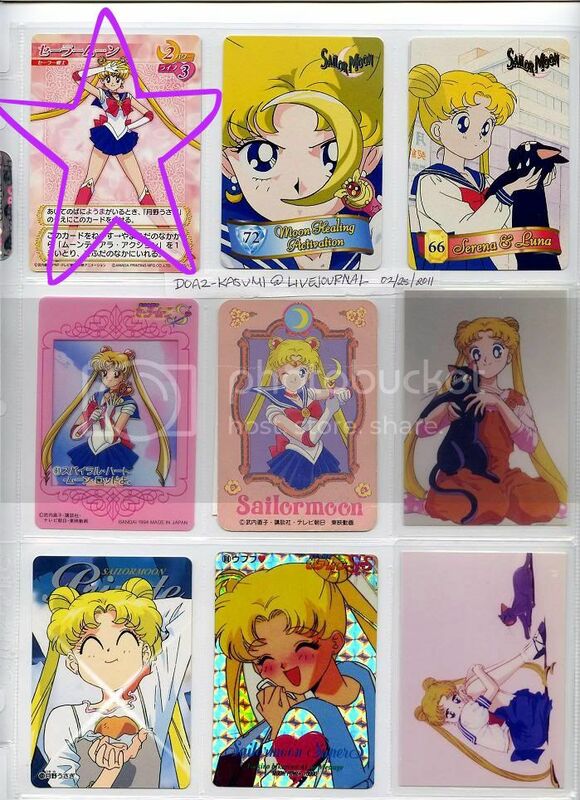 Most of the lami cards are actually bootlegs (nice ones tho...i'm happy with them. i'd make my own cards if my printer is that high quality. xD). Only real lami in my collection is Neptune & Pluto. Wonder why I didn't put a white cross on that one since it's just as nice the one next to it. >->; $2 for it. 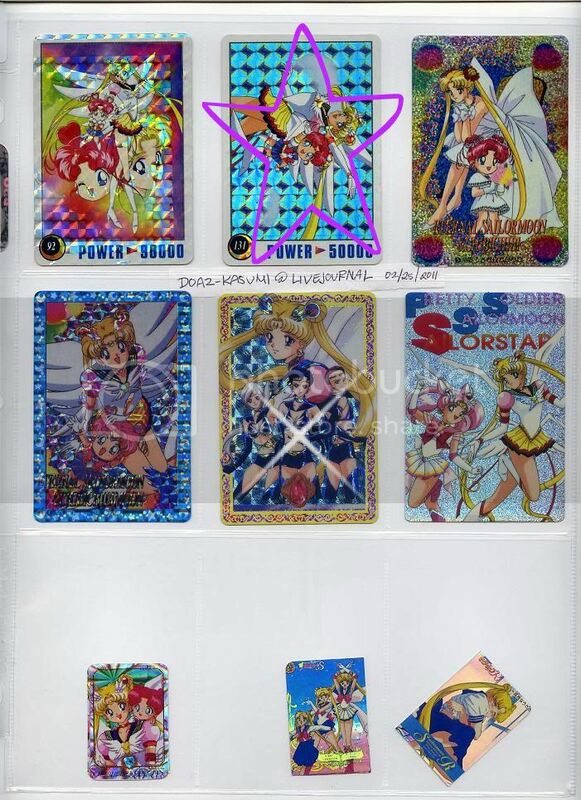 That's an official prism from Bandai Carddass World EX3. Bought it as a single so cost me quite a bit. Is $5 ok? I really like those images, so maybe $3 for the coloured dresses and $1 for the black dresses w/ roses? I have a shitajiki & poster with that image already so not too attached to it. Hello~ Yes, I still have a lot of cards left for sale. xD Someone did buy me out of all the jumbo cards a few days ago, tho. 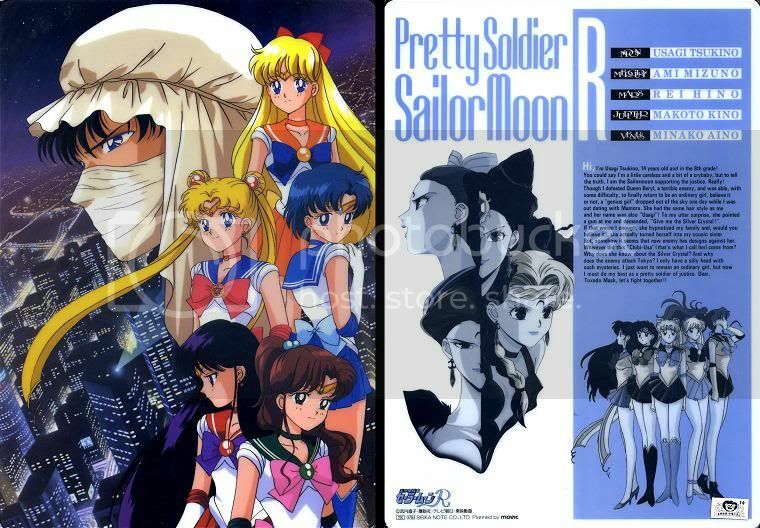 I got a binder of bootlegs I want to replace :D ! I'd like whatever freebies are left? I'd also be up for trading >___>;;; . 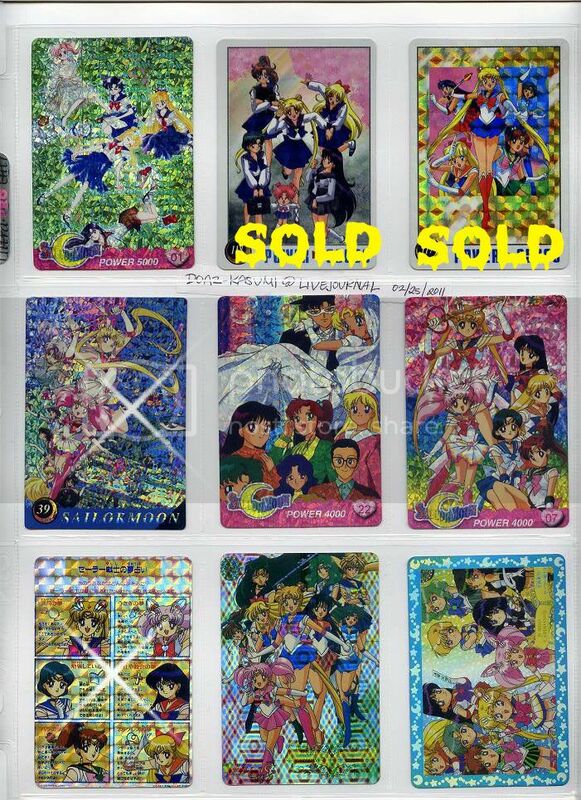 Everything is legit except for the Sailor Mercury teleca in the last link. 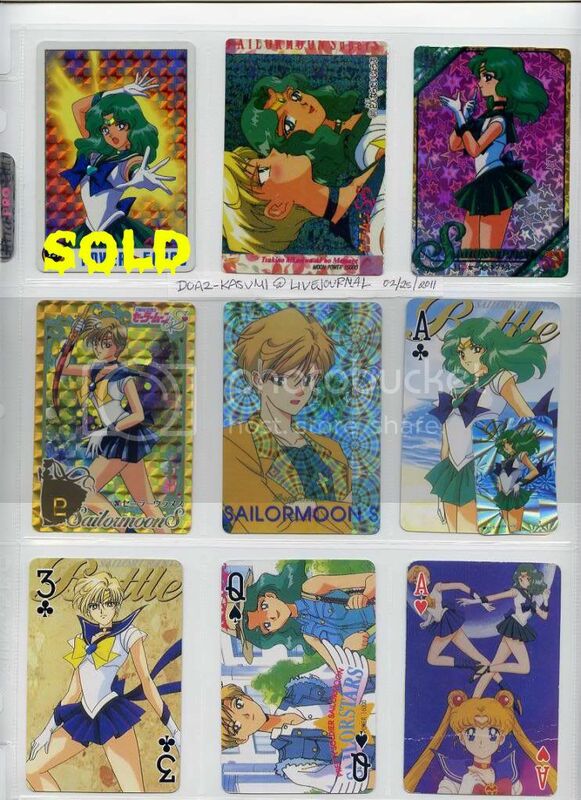 Nnn, not sure if I wanna part with the Sailor Pluto card but everything else is available. 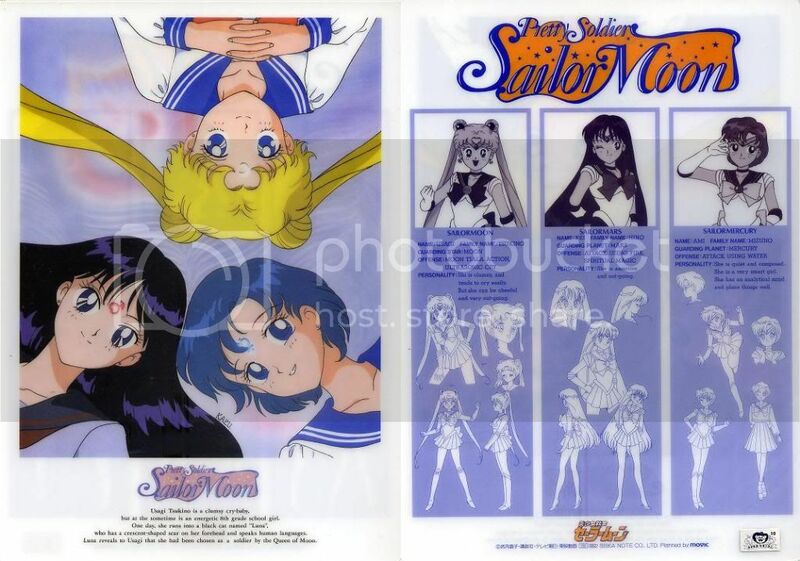 As for freebies, I think only the Sailor Moon DiC doll and the notebook stickers are left. Startin' a new thread, so things are easier to keep track of. What is the American card? Is it from the Awesome series? You want all the pencil boards I have? So total would be $38 for all shitajiki, or $25 if you don't take SM28. $0.50 - #5. it's from the Archival series. can't remember how much this cost me exactly, but i know it wasn't cheap. might have been $8 but i'll sell for $6. #8 thought i already sold you this one? don't think i have an extra, lol. Umm, so if calculated correctly (got a headache atm = =), total for the cards would be $22. If you take them all, can reduce it to $15. Overall discounts for everything listed about $25? Depending on how much shipping costs, might even go half off on that as well. Hello! 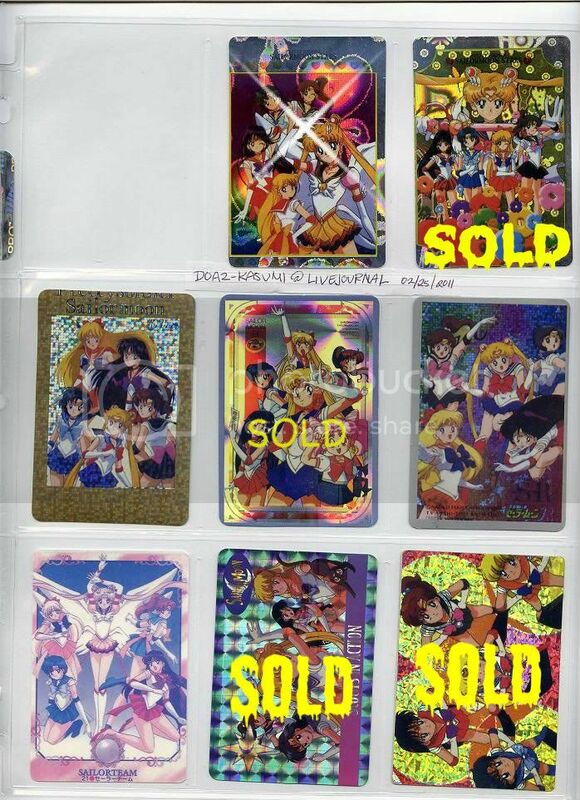 Yes, still selling cards but not everything is accurately marked. Have sold a few things but let me know which ones interest you and I'll check their availability. 8. viewing 57 of 74, card 3 sailors with round flowers on it? How much total? Ship to florida 33460 usa. Thankyou. cannot find this one in my binder, so think it has been sold. Let me know if you want to change anything. 2 and 8 50c and 50 cents ? About SSJ: yes, it's a smudge on her nose. bought it that way so must be an imperfection during printing. 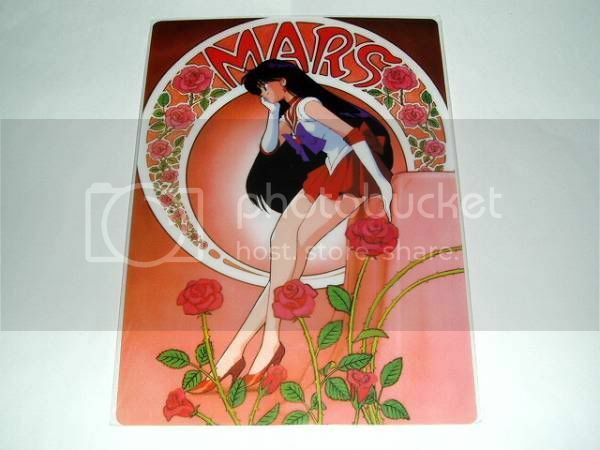 Do you still have that memo pad with Outer Senshi? I do but not for sale. Sorry. I have an extra Outers notebook, tho. Hello! 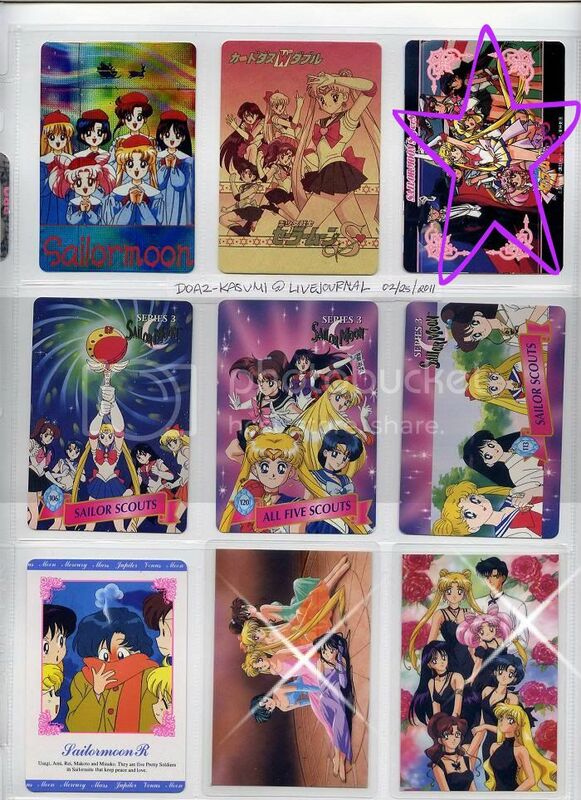 I'm very interested in a lot of your sailor moon sticker cards. May I ask if you still have any for sale?